The most powerful and flexible digital mixer for recording and live sound. The 32-channel StudioLive® 16 is the most powerful and flexible digital mixer available for live sound and recording. 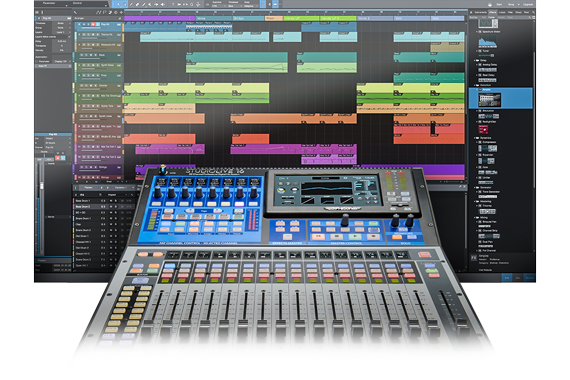 PreSonus® gave the StudioLive 16 the works: 40 total inputs; extensive AVB networking; more recording tracks over USB than any other digital mixer; touch-sensitive motorized faders; and a host of State-space modeled Fat Channel plug-ins that let you expand your processing options. Packaged with a full suite of integrated software, including PreSonus’ Studio One® DAW and Capture™ live-recording software, the StudioLive 16 is a groundbreaking professional digital mixer and USB audio interface in a compact, scalable design. The scalable digital mixer that grows with you. Every audio system is built to solve a unique set of problems. The StudioLive 16 digital mixer and the PreSonus ecosystem of AVB networking products allow you to create a system that is truly customized for your needs. Connect NSB-series stage boxes to add remote analog inputs and outputs wherever they’re required and complete your 32-channel, 16-bus StudioLive 16. Add EarMix 16M personal monitor mixers to give your musicians their own customizable 16-channel monitor mix. Multiple StudioLive Series III digital mixers can be networked together, allowing you to route audio to and from any device on the audio network thanks to the flexibility of Digital Patching available both onboard your StudioLive 16 digital mixer and inside UC Surface remote mixer software. Learn more about the advanced AVB networking in the StudioLive Series III digital mixers. AVB (Audio Video Bridging, also known as Time Sensitive Networking, or TSN) is a collection of IEEE 802.1 networking standards that define a single digital network for transmitting audio, video, and other forms of data via “smart” switches that manage AVB traffic without compromising network integrity. AVB networking allows you to connect many digital audio devices over long distances using CAT5e or CAT6 Ethernet cable and route your audio anywhere on the AVB network with extremely low latency. A high-precision clock significantly reduces harmonic distortion and phasing, ensuring your audio stays clear and clean. AVB Switches (such as the PreSonus SW5E PoE AVB switch) are an active part of the AVB network, throttling non-AVB traffic to ensure you always have enough bandwidth to carry your audio with extremely low latency. This means you get guaranteed low-latency audio performance regardless of other network traffic. These important benefits are only available with AVB networking. Still curious about AVB networking? Check out our Learn section. The best digital mixer for recording - with or without a computer. 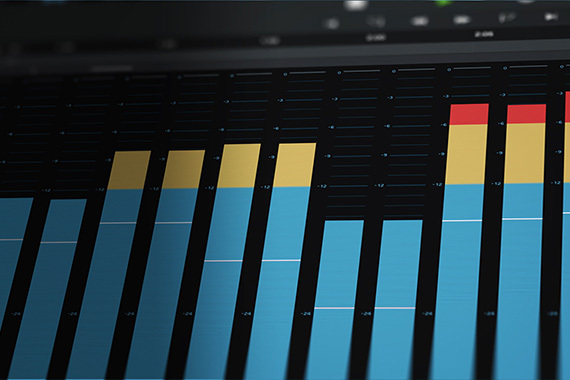 PreSonus Capture recording software is an intuitive, rock-solid multitrack recording application with a fully integrated Virtual Soundcheck mode that runs directly on your StudioLive 16 digital mixer or on your macOS or Windows machine. This gives you the option to record to your computer using the USB audio interface built into your StudioLive 16 digital mixer, or leave your laptop at home and record 34 streams directly to an SD card. Record any combination of channels, FlexMixes, and the Main stereo mix either to USB, to an SD Card, or both for the ultimate redundant live recording rig with the touch of a single button. StudioLive mix scenes can be stored with your recordings to speed up Virtual Soundchecks. Best of all, Capture sessions open natively in Studio One with the entire StudioLive mix scene recreated in the Studio One console, complete with fader levels, Fat Channel settings, mutes, solos, and more to launch your live mix right where you left it. Learn more about the built-in multitrack Capture SD recorder. Designed exclusively for StudioLive digital mixers, Capture continues to be the most reliable and easiest-to-use live recording software. StudioLive Series III digital mixers provide all the advantages of Capture without the computer. Insert an SD card, press Record, and Capture does the rest, recording any selection of 34 streams from your StudioLive 16 digital mixer. In situations where you’d like to record fewer streams, Capture allows you to individually record-arm selected channels to simplify your Capture session further. Capture was created for live multitrack recording. No other digital audio workstation software makes recording as fast, simple and hassle-free, so you can focus on mixing the show. Seamlessly integrated with the included PreSonus Studio One® Artist DAW, the StudioLive 24 Series III mixer works with virtually all Mac and Windows audio-recording software. Built by creative people for creative music production, Studio One is easy to learn and enables you to compose, record, and produce your masterpiece without getting distracted by the tools. Studio One also enjoys a robust online community of enthusiastic and helpful users you can turn to for advice. Need a new loop or sample for your latest production? Studio One lets you shop, audition, and purchase new content right from your production environment. Learn more about Studio One. Live Mixer. Studio sound. Fat Channel plug-ins bring your mix to life. The dynamic Fat Channel on the StudioLive 16 digital mixer puts critical EQ and Dynamics functions beneath your fingertips while giving you fast access to every parameter via the full-color touchscreen or from the Fat Channel encoders, depending on how you like to work. The StudioLive 16 digital mixer comes with ten vintage EQ and classic compressor Fat Channel plug-in models that can be used onboard your mixer as well as within Studio One. And when you’re ready for more options, PreSonus offers four Fat Channel plug-in collections with fifteen additional models from which to choose, giving you a host of new signal processing options. While Fat Channel plug-ins are available for every input channel, every output bus on the StudioLive 16 digital mixer is equipped with a fully variable 6-band parametric EQ, compressor, and limiter. Now you can enjoy extensive, studio-style processing whether recording in the studio or running shows on the road. Learn more about the best digital mixer for flexible processing options. Fat Channel processing on the StudioLive 16 digital mixer includes both input and output delays, highpass filter, gate, compressor, limiter, and fully parametric EQ on all channels. There are no limitations, no shared resources, no figuring out what processing is available where. You have all of the Fat Channel processing available at all times, with no compromises or caveats, along with a library of professionally crafted presets and the ability to save, selectively recall, and A/B-compare processor settings. In addition to Fat Channel processing, the StudioLive 16 digital mixer offers ten classic reverb and delay models that are available on four dedicated effects buses. The StudioLive Series III Fat Channel also offers insert plug-ins that will be instantly familiar to anyone who has ever used a digital audio workstation software. Each input channel on the StudioLive 16 digital mixer is equipped with alternative vintage compressor and EQ models, allowing you to customize and sculpt the shape of each sound source. These State-space modeled Fat Channel plug-ins emulate the individual components of the original hardware, so they sound and behave just like the vintage EQs and classic compressor designs that are responsible for some of the most legendary sounds in the music industry. Every Fat Channel plug-in model is available both onboard your StudioLive 16 digital mixer and inside Studio One, so you can use your favorite dynamics and EQs both on your mixer and in your DAW. Studio One native models are provided for free when you purchase additional Fat Channel Plug-in Collections. A digital mixing console customized for you. The StudioLive 16 digital mixer offers a flexible design that allows you to personalize the layout to better fit the way you work. A customizable User layer lets you create a view for any assortment of channels and buses on the 25 touch-sensitive motorized faders, making it easy to simplify a complex mix. Similarly, the dynamic Fat Channel can be laid out to put the parameters you care about most right at your fingertips. An optional accessory shelf is available to add up to three additional touch screens to your StudioLive 16 digital mixer using UC Surface and your iPad® or favorite Android™ device. Learn more about the Fat Channel. The unique design of the dynamic Fat Channel found only on the StudioLive Series III digital mixers provides intuitive and detailed control to speed up your workflow and puts the most critical parameters for your mixing style at your fingertips. Eight digital scribble strips, encoders, and multicolored buttons, paired with a seven-inch touchscreen, deliver detailed information and offer amazingly fast navigation. In addition, the StudioLive Series III digital mixers’ exclusive, customizable Fat Channel User layer puts your eight most important channel-processing elements right on top. Create buses and groups you need. Whether you’re mixing in the studio or for a busy festival stage, the buses you need to facilitate the mix you want to create change. 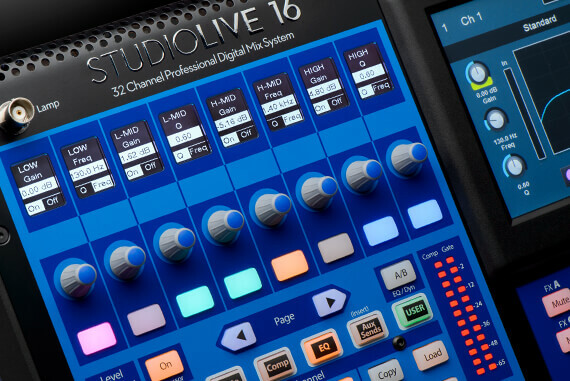 PreSonus designed the StudioLive 16 digital mixer to adapt with those changing needs. 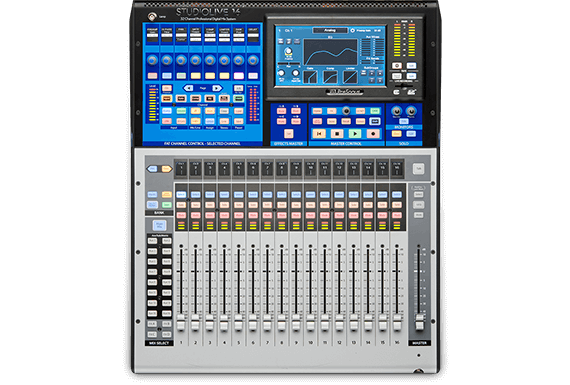 Each of the 16 FlexMixes on the StudioLive 16 digital mixer can be individually configured to function as an aux bus, a subgroup, or a matrix mix. An additional four static subgroup buses and four designated effects buses provide a total of 24 mix buses plus an independent solo bus and the main mix. We also provided 24 DCAs so you can more easily and flexibly control groups of channels. 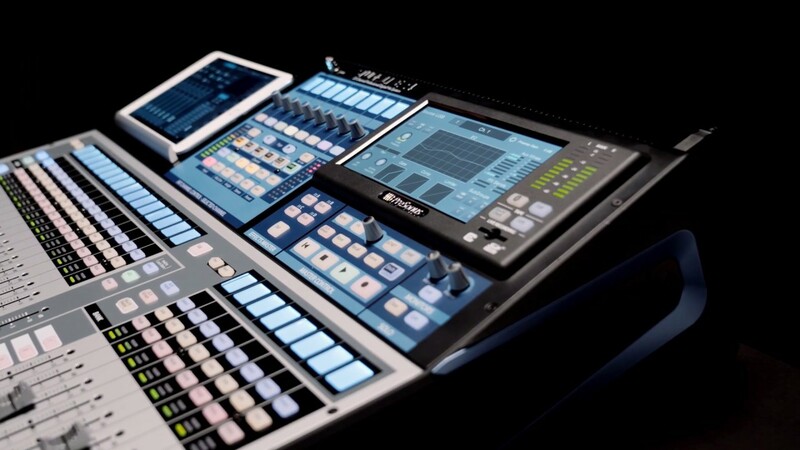 And with flexible viewing options for the 17 touch-sensitive motorized faders, you can easily manage your 32-channel mix in two efficient layers. The Master fader can even be locked to always control your main mix or to follow the currently selected mix. Reconfigure your mix without unplugging a single cable. StudioLive Series III digital mixers incorporate the concept of an analog patch bay and digitize it. This lets you patch any analog input or digital return (AVB, USB, or SD) to any channel you like and customize your mix configuration. This flexible feature also allows you to freely route audio to your AVB network and record anything you’d like via USB, so you’re not limited to recording just the input channels and the main mix. Learn how StudioLive Series III digital patching provides incredible flexibility. The Digital Patching menu on the StudioLive 16 digital mixer has many applications, such as the ability to set up parallel processing and routing the same signal to multiple places on an AVB network. Here’s another useful application: Patch 16 of the StudioLive 16’s analog inputs to channels 1-16 to create a layer for front-of-house and set up separate patching and processing on for those same analog inputs on channels 17-32 to create a monitor layer. It’s like having a separate front-of-house and monitor mixer in one console. 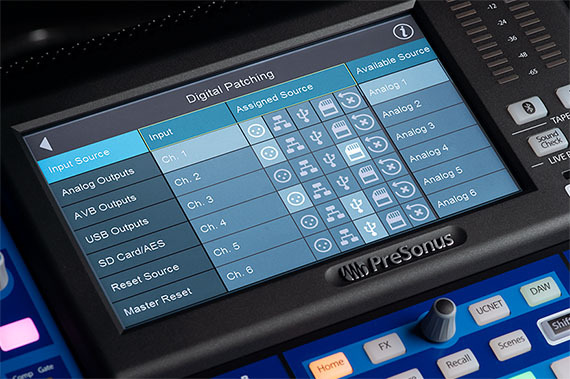 For more details on these and other applications for digital patching, see Power Tools: PreSonus StudioLive Series III tricks from the August 2018 issue of Front of House magazine. The ultimate USB audio interface and DAW control surface with motorized faders. With 128 channels (64x64) of USB I/O, the StudioLive 16 is not just the best digital mixer for live sound recording; it’s the best digital mixer for the studio as well. Each channel can independently access its analog input or its dedicated digital return from your computer. And recording is simple and easy. Studio One and the StudioLive 16 digital mixer are the perfect pair to elevate your studio recordings. Remote control the StudioLive 16’s recallable XMAX mic preamps and Fat Channel processing with Studio One Artist for low-latency recording with effects. Press the DAW button your StudioLive 16 digital mixer and use the 17 touch-sensitive motorized faders to control your Studio One mix. Seamless integration and thoughtful bidirectional control with Studio One make the StudioLive 16 the best mixing console for the modern recording studio. Learn more about the complete StudioLive Series III Software Library. Remote control your digital mixer from anywhere… on any device. PreSonus StudioLive 16 digital mixers are tightly integrated with an entire suite of state-of-the-art software. Mix wirelessly using UC Surface touch-control software for macOS, Windows, iPad® and Android™. Control your monitor mixes with QMix-UC for iPhone®, iPod touch®, and Android devices. A dedicated 1 Gb Ethernet port is provided to connect to a wireless router and create a control network for devices running UC Surface or QMix-UC. Adjust monitor mixes on stage; move around the room to dial in your mix; or add an accessory shelf and use your mobile device as a second screen for your StudioLive 16 digital mixer. The back panel of a StudioLive 16 digital mixer is equipped with plenty of local analog I/O. 16 local analog mic/line channel inputs make it easy to connect a variety of gear. 10 local mix outputs let you route to floor monitors, delay stacks and more. But the local I/O is only half the story. Connect your StudioLive 16 digital mixer to an AVB audio network and add remote inputs and outputs anywhere you need them using NSB-series stage boxes. PreSonus built our reputation designing great-sounding analog circuits for critical studio recording environments, and we put all of that experience into designing the StudioLive 16 digital mixer. In 1995, PreSonus patented digital control over analog circuits with our first studio product. Building on this legacy, we created a separate digital volume-control circuit ahead of our lauded analog XMAX mic preamp design, providing the convenience of digital recall without sacrificing fidelity. This allows the StudioLive 16 mic preamps to be remote-controlled with UC Surface software or Studio One, and when you load a StudioLive 16 mixer scene, the mic preamp trim values can also be recalled along with the other settings. What makes the StudioLive 16 the best sounding digital mixer? PreSonus understands that great sound begins at the start of the signal chain. This is why we spent years perfecting our XMAX Class A mic preamp design. Equally at home in the studio or on stage, the XMAX design provides high headroom, low noise, wide dynamic range, and extended frequency response that you will instantly recognize by its musicality and transparency. The Class A circuits in the XMAX design have no crossover distortion and deliver transparent audio. Backed by 30V power rails, the XMAX mic preamp delivers more headroom, deeper lows, smoother highs, and a richer overall sound. The discrete design of the XMAX microphone preamplifier ensures ultra-low noise and transparency. The net result is a mic preamp that lets mic’d signals shine through your mix without any coloration and sound as pure as their source. 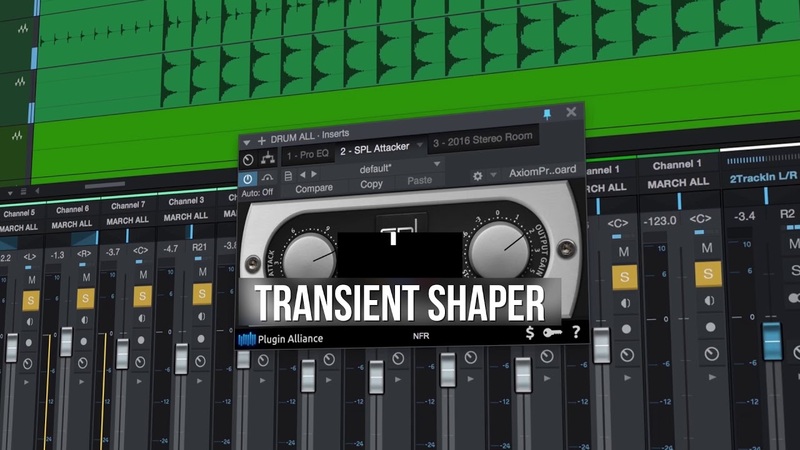 This suite of plug-ins adds a wealth of fresh virtual instruments and effects to Studio One. Cherry-picked from the first names in virtual instruments and effects, each plug-in brings a different flavor of practical magic to your songs. These plug-ins aren't gimmicky one-trick ponies — these are real-deal workhorses that you'll rely on for countless mixes. Content and terms of the Studio Magic Plug-in Suite are subject to change. The editing experience is fantastic with these smaller screens, and the combination of using them in tandem with the touchscreen is great, with the latter giving handy visual feedback.